An international team of researchers, led by Dr. Asier Gomez-Olivencia of the University of the Basque Country (UPV/EHU) and including Binghamton University anthropologist Rolf Quam, has provided new insights on one of the most famous Neandertal skeletons, discovered over 100 years ago: La Ferrassie 1. “New technological approaches are allowing anthropologists to peer even deeper into the bones of our ancestors,” said Quam. “In the case of La Ferrassie 1, these approaches have made it possible to identify new fossil remains and pathological conditions of the original skeleton as well as confirm that this individual was deliberately buried. The adult male La Ferrassie 1 Neandertal skeleton was found in 1909 in a French cave site, along with the remains of an adult woman and several Neandertal children. All of the skeletons were interpreted as representing intentional burials, and the finds sparked much public interest at the time regarding just how human-like the Neandertals were. The La Ferrassie 1 skeleton, in particular, has been highly influential in Neandertal studies since its discovery. La Ferrassie 1 was an old man (likely over 50 years old) who suffered various broken bones during his lifetime and had ongoing respiratory issues when he died. 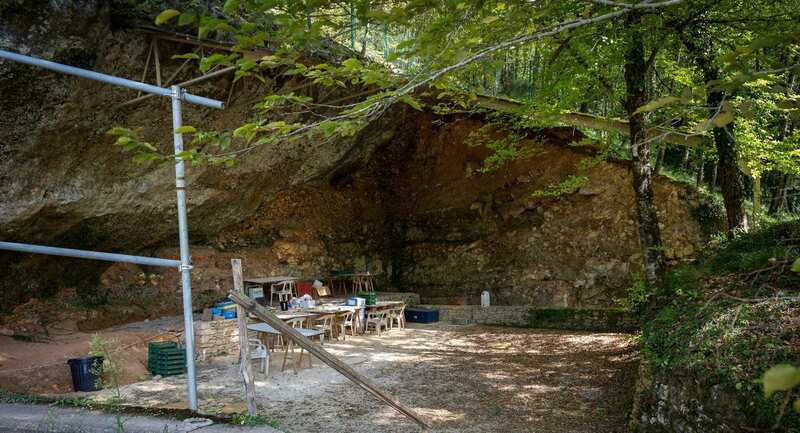 Soon after, he was buried by other members of his group in the La Ferrassie rockshelter, which was repeatedly occupied by Neandertals during millennia. The skeleton was found in a burial pit and has been dated to between 40,000 and 54,000 years. This skeleton is one of the most important Neandertal individuals both for its completeness and due to the important role it has played historically in the interpretation of Neandertal anatomy and lifeways. Now, researchers have applied some of the latest technological approaches to reveal long-held secrets in the skeleton of this iconic individual. The bones were subjected to high resolution microCT scanning to study the internal anatomy of the skull and several of the bones. The middle ear bones (malleus, incus and stapes) were identified in the scans, held in place inside the skull by sediments from the La Ferrassie cave floor. These are the smallest bones in the human body and are often not preserved in archaeological skeletons, but it was possible to extract 3D virtual models of the bones for analysis. The ear ossicles are complete and help provide a better understanding of the range of variation of this anatomical region in Neandertals. Several pathological conditions were also identified in the skeleton, including a fracture in the collar bone (clavicle), arthritis of the spine and mild scoliosis. Researchers also examined the archaeological materials from the original excavations and identified several new fragments of vertebrae and ribs of La Ferrassie 1. Study of the original skeleton and analysis of the fracture pattern of the cranium and long bones relying on modern forensic criteria confirmed that nearly all of the fractures were post-mortem (i.e. after death), when the bones lost collagen and were fractured in situ due to the weight of the overlying sediments. Nevertheless, the anatomical connection between the bones was not affected, confirming the original observations made over a century ago by their discoverers, that the La Ferrassie 1 individual was deliberately buried by other members of their social group.